Today we bought a plastic bat for Anya. We asked her to select a bat of her choice. 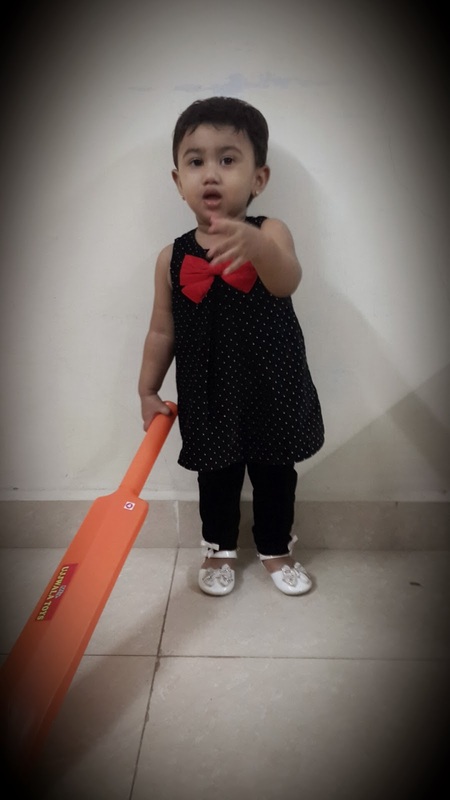 She chose a bat which had Irfan Pathan's picture in it. She rejected Yusuf Pathan, Dinesh Karthik and Rohit Sharma. After coming home, she made me bowl to her. I would roll the plastic ball towards her and she would make a wild swing. Whether she connects the ball or not, she made sure that the bat connected with some part of my body every time. Now I am typing this post in pain. Her batting style reminded me of the infamous Javed Mianded spat with Dennis Lillie. Some of you might not be knowing about that infamous incident. For such people, I am posting the video of the fight. Watch and enjoy. Lesson learnt : Groin guards are a must even when you play with a plastic ball and a plastic bat.